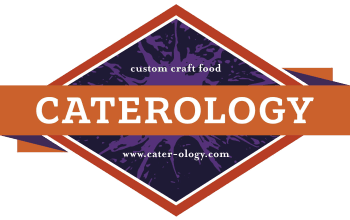 Each Caterology pizza is individually crafted in a blended tradition (Italian & California style) and is wood-fired at 900˚ for apx. 90 seconds, producing a light, crispy crust and perfectly cooked toppings on a 10” - 6 cut pie. You may choose from two different serving styles – “ By the Slice" or “ Made to Order”. If you chose “By the Slice”, we make a variety of pizzas and replenish them throughout service with a combination of our custom pizzas and some basics like pepperoni and cheese. This allows guests to get a variety of pizza types however, they are not kept hot so during slow times the quality may diminish. If you choose “Made to Order” we cook custom pizzas to order so each guest gets exactly what they would like. Made to order pizza is preferable however this option limits our production to 30-40 pizzas per hour and may increase the overall service time. A two-week notice is required for a Wood-Fired Pizza Oven event. We book for rain or shine. Cancellation policy is 2 weeks advance notice. In addition to pizza and salad options chosen, pricing includes delivery, setup (1 hr), prep & service (2 hrs), and breakdown (1/2 hr). For longer events (over 2 hrs service), additional prep & service is available at $125/hour. Event minimum is $750. Gratuity is optional, but appreciated. Gates or other openings through which the pizza oven may pass through must be at least 7′ wide. Driveway or other parking area should be concrete/cement or asphalt. Lawn parking for the pizza oven may be possible when dry, however this is not recommended as the front wheel may cause turf damage. Space is also needed for parking the delivery truck (Ford Transit 250 extended). In order to supply power to our pizza dough roller and prep table, an electrical outlet (20 amp breaker) will be required. In circumstances where an outlet is not available, our generator can be used. In this situation, we would locate the generator as far away from the festivities as possible as it produces a fair amount of noise. When the pizza oven initially fires up on site, visible smoke is produced, but will lessen once optimal cooking temperature has been reached. Also, if the pizza oven is located very near–or upwind–of a smoke detector, the alarm may sound until the smoke subsides. Note that for most event schedules, the temperature & smoke will have been regulated by the time guests begin to arrive.